Just when you thought British politics couldn’t get any more exciting, cabaret performer and celebrity impersonator Fagulous will be hosting through-the-night election coverage at Her Upstairs as Prime Minister Theresa May. The Fagulous Election Broadcast Spectacular will feature a landslide of campery courtesy of Ruby Wednesday, TV TV, TeTe Bang and Ripley. Piab’s Vegan Junk Food will also be on hand throughout the night to keep your energy up as the results come in. 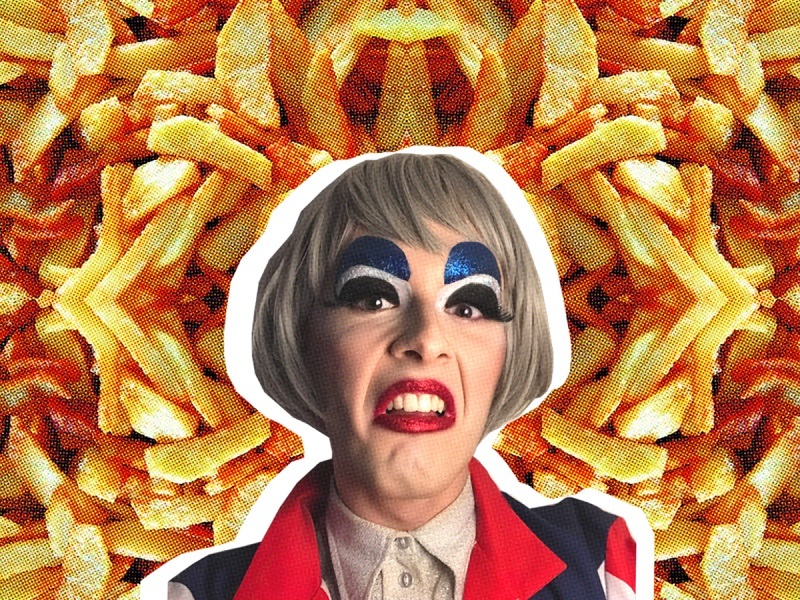 Whatever is in store for us come 9 June, it can’t be half as fun as what Fagulous would like to carry out. We asked her to lay out a manifesto and here is what she had to say. Politicians remain unaware of what the general public really want. They fool us with fanciful manifestos that never add up, and beg us to give them our vote. Well, ladies and gentleman and people of the United Kingdom, as you go to vote on June 8th, I ask you to imagine a Britain governed not by the political elite but the fabulously outrageous. This is the official Fagulous Party manifesto. Enjoy! My first pledge as future Prime Minister is to eliminate all taxation in the UK. Tax is not a necessity in a Fagulous modern Britain. Instead, people of the UK will host regular bake sales with all funds going directly to the essential services that keep our country going, like the police force, our trusted NHS and the indisputable rock of civilisation, Greggs the Bakers. Law and order is at the heart of my manifesto. Terrible crimes are being committed every day in kitchens across the UK. I would impose a complete ban on cheap bin liners – only strong and stable bin liners in the UK please! Possession of the tatty plastic rubbish sacks will result in a minimum of a three year custodial sentence. Student debt is a huge burden facing the current generation of young people. Many students simply cannot afford to study, which will have a huge impact on clubs and bars that rely on students wasting money on three-for-two shots on student nights. I call for all degrees to be replaced with Blue Peter badges as I think that students would have no qualms with paying upwards of £9,000 to receive a blue badge with an embossed ship on it. Quite frankly, Blue Peter badges are probably worth more than a First Class honours degree anyway. Imagine a UK where every £20 note featured Tilda Swinton’s face looking gorgeously androgynous. Whoever that guy is on the current £20 looks proper old, no one wants an ugly old man staring back at them as they reach into their purse. Our purses deserve someone FABULOUS and Liz isn’t cutting it. Increasing public bank holidays is a must for the morale of the British people. What better person should we dedicate an entire day to than Dame Barbara Cartland! People will attend street parties dressed head to toe in pink gowns and frilly bows accompanied by pekingese dogs. The country will unite as we celebrate the greatest trash author to have ever graced this wonderful country. The national anthem is overdue an overhaul and I pledge that the UK will replace God Save the Queen with something a bit more fun. I propose the Shirley Bassey version of I Am What I Am. At prestigious sporting events, the people of Great Britain will all rise, holding their hands to their hearts to sing this campy number. The rapturous applause will be audible all around the world. Truly world inspiring. Towns and villages across the UK will have statues built to commemorate all the late great homosexuals that Britain has ever had the privilege to call their own. Tourists will flock from far and wide to witness the greatest erections of Quentin Crisp or Noel Coward that you could imagine. Under a Fagulous Party government, all government officials will wear full drag when undertaking important meetings with other global leaders. Imagine the Brexit negotiations with the European Union if I as your leader was dressed as Liza Minnelli; even Merkel would be on my side! You can follow Fagulous on Twitter and find out more about what she has planned here.